WASHINGTON (CN) – President Donald Trump campaigned on the promise that he would fill the vacant ninth seat on the U.S. Supreme Court with someone who would follow in the steps of the late Justice Antonin Scalia. The messaged worked, with 27 percent of Trump voters saying Supreme Court appointments were the most important factor in their decision to vote for him, according to NBC News exit polls. Looking at the judge tapped Tuesday from the 10th Circuit Court of Appeals to fill the job, many believe Trump kept his promise to voters. “Overall it’s as if Scalia lived and got 30 years younger,” Mark Graber, a professor at the University of Maryland Carey School of Law, said of the nominee in an interview. U.S. Circuit Judge Neil Gorsuch is similar to Scalia in a number of ways. He shares the conservative icon’s alma mater and textualist legal philosophy, while writing with a lively, accessible writing style that echoes Scalia’s famous opinions. Legal experts predict generally that Gorsuch, should he survive a contentious approval battle in the Senate, will likely not change the court much from what it looked like before Scalia’s death. There are particular areas of the law, however, on which he could have a profound impact. Most notable, if not most exciting, is how Gorsuch feels about the court’s role in weighing in on ambiguity in administrative law. While Scalia favored a judicial doctrine known as Chevron deference, which lets administrative agencies interpret their own ambiguous statutes so long as their interpretation is reasonable, Gorsuch has been critical. In a concurring opinion he wrote to the case Gutierrez-Brizuela v. Lynch last year, Gorsuch wondered whether it was time to “face the behemoth” of the Chevron deference. While that may seem like a small potential change, Chevron deference comes down to how much power is vested in the executive branch. With Gorsuch being skeptical of the doctrine, it could mean the court gives less space for executive agencies to interpret their statutes. 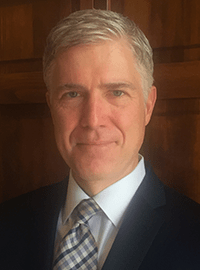 Gorsuch could also bring with him a strong preference for individual liberty, especially in cases of religious exemptions to the free-exercise clause. This would bring another reliable vote to the conservative justices on the court in those cases, though it is hard to predict with Gorsuch’s limited record, said Howard University Law professor Steven Jamar. “With all those caveats, I think that what we’re going to see is that he’s going to favor a sort of radical version of individual liberty over just about anything else and so that could play out in a lot of different ways, particularly in cases involving equality,” Jamar said in an interview. Gorsuch could also have an impact that extends beyond his legal philosophy. While Scalia’s biting dissents made him famous among court watchers and lay people alike, his style might have prevented him from winning other justices to his side behind closed doors. Young, the law professor from Duke, said Gorsuch might be more similar to Chief Justice John Roberts, rather than a firebrand like Scalia, in managing the interpersonal relationships of other justices. It could be key to winning them over in arguments. If he is able to bridge gaps more effectively than Scalia, that could give conservatives a reliable 5-4 split on the high court. What that means for specific cases that conservatives have long criticized remains unclear. It has long been a conservative dream to overturn Roe v. Wade, for example, but just adding Gorsuch to the bench does not immediately mean the court will kill that ruling. This is especially true if Gorsuch has a great deal of respect for precedent and the traditional stance of courts to allow old decisions to remain in place, Young said. Instead, Young said Gorsuch’s appointment could empower conservatives to nibble “around the edges” of past cases, carving out exceptions and creating holes in the law that better fit their judicial theories. If he were putting money on it, Graber said the case most likely to be overturned is the court’s deadlock in Friedrichs v. California Teachers Association from last March. The case, which involved whether public employees can be compelled to pay fees to a union they have not joined but still benefits them, was argued with Scalia still on the bench but decided after his death. Slotting Gorsuch in Scalia’s seat would likely give conservatives a clear 5-4 majority in any similar case that would come before the court again, Graber said. “The first place to look for movement is go to the places that went 4-4 in the last term and assume they break 5-4 for the conservatives,” Graber said. But just what Gorsuch will mean to the Supreme Court is still not clear, even with a clear list of opinions he authored and joined as a federal judge. Where he will side on specific cases and toward which justices he might drift will only come into focus when, and if, he takes the bench.